Studies have shown that as much as 50% of the air in your home comes from your basement or crawlspace. This air is often higher in moisture content, and carries with it various allergens and musty odors. When conditions linger above 60% relative humidity for extended periods of time, mold, mildew, and bacteria growth is stimulated. The American Lung Association, American Medical Association, and the EPA recommend maintaining relative humidity level in the 30% - 50% range. Ventilation and air conditioning alone cannot provide the protection offered by a premium dehumidifier like the Santa Fe Max Dry Dual XT. Protecting your family, your biggest investment is worth the best. The Max Dry was specifically designed for large basements and crawlspaces. The high-capacity (415 cfm) blower on the Max Dry circulates air more effectively in larger applications. The Max Dry's horizontal configuration and dual outlet design performs exceptionally well in basements and crawlspaces. Optional condensate pump and ducting kits provide the installation flexibility necessary for the most challenging applications. High Efficiency -The high efficiency Max Dry produces over 7.9 pints per kilowatt/hour, far better than any mass merchant dehumidifier. Large Capacity -The high capacity Max Dry provides up to 150 pints per day water removal at standard rating conditions*. Large-sized basements and crawlspaces (up to 3600 sq. ft.) are no problem for the Max Dry. Low Temperature Operation -The Max Dry was engineered for the temperature and air flow issues that surface in crawlspaces and basements. When many mass-merchant dehumidifiers have stopped removing water, the Max Dry continues to protect your family and your home. Superior Air Filtration -MERV-11 filtration is standard on the Max Dry, capturing particles (including mold spores) down to 1 micron in size. This superior level of air filtration keeps the Max Dry working at peak efficiency while cleaning the air. 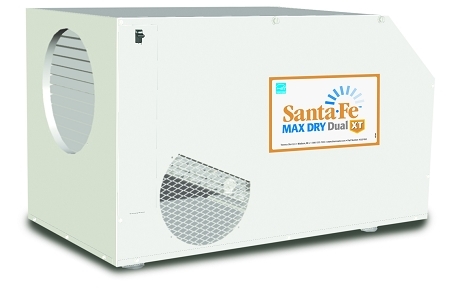 Optional Equipment -Ducting kits and condensate pumps are available for use with the Max Dry. These optional kits provide the ultimate in flexibility for your specific installation requirements. *AHAM standard testing conditions are 80F and 60% RH.